Slade, aka Kilmacow Slade, is a 6½-year-old red brindle male, born on January 24, 2002. Slade's sire is SC's Mask Rider, and his dam is Esquire Tanya. 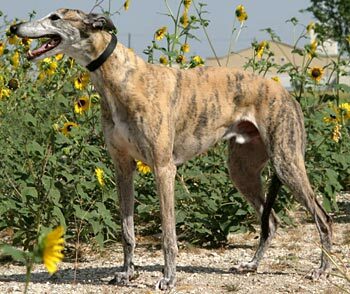 Slade raced in the eastern part of the US, beginning in August, 2003, at Lincoln Park in Lincoln, RI. 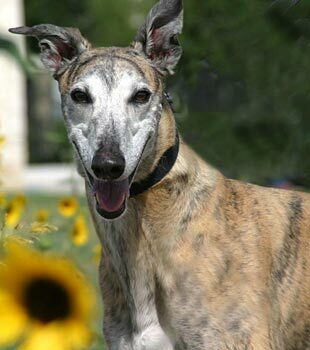 From there he moved to Connecticut, and competed at the Shoreline Star Greyhound Park as a Grade A racer. 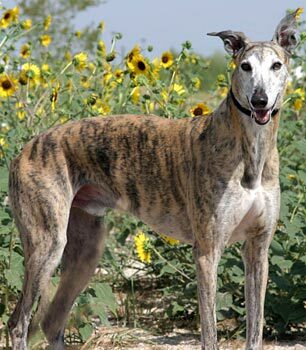 After finishing his 95th and final race in October of 2005, Slade headed south to Texas to plan his retirement. Slade was adopted and in a home for almost 2 years, but it was not to be his forever family. Quite the 'leaner,' Slade is a very affectionate and people-oriented boy. Slade has shown himself not to be cat tolerant, but he appears to be small dog tolerant. The phrase "gentle giant" describes Slade perfectly. When he first came to his current foster home, he was fearful, hesitant and cowered. We have no idea why, but he reacted much better to women than men. But he was always polite, affectionate and ever ready to accept a treat - even though he had to be coaxed a little. That was then. This is now. In the past few months, Slade has come out of his shell. He's a wonderful "big brother" to his Greyhound sister (who remains firmly in charge). He eats his food politely with not an ounce of food aggression and when he does try to steal some from the other dish, sis' snarl immediately sends him packing. He is not much of a counter surfer, although it may be he is just getting there too late! He enjoys the big back yard where he romps and plays for endless hours. Best of all, he's regained confidence and security in his surroundings. He will push that big nose into your arm until he gets the affection he wants (he can never get enough!) and lean on you for hours if you'll let him. He prefers his person's bed to his own but knows what "no" means!! Although he barks on occasion, he is definitely NOT a barker. He's still a little reserved - but I suspect that's just his personality. He has been around very small children (3 and 2) and he was wonderful. He is small dog tolerant, but we do not believe he is cat tolerant.